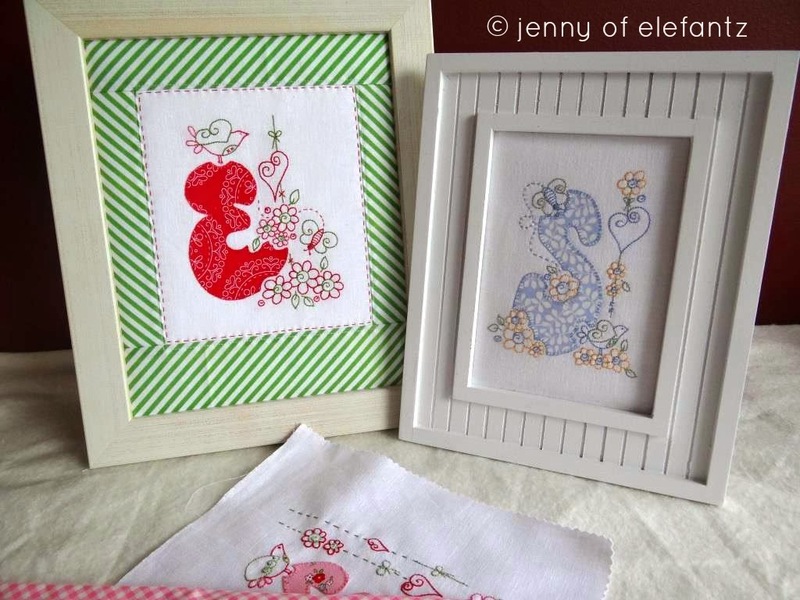 Jenny of ELEFANTZ: GIVEAWAY - the Rosedaisy Alphabet! GIVEAWAY - the Rosedaisy Alphabet! Another design I revealed to the girls down in Melbourne over the weekend was my brand new "Rosedaisy Alphabet"
It all began over a cup of coffee a few weeks back when I drew up two letters to stitch for my granddaughters. After I'd stitched and framed them I just knew I had to sketch up the remaining 24 letters of the alphabet. When I design, I sketch what's in my mind, and when I'm happy it's refined with a black pigma pen before rubbing off the pencil lines and scanning for using in a pattern. ...and that's how an Elefantz design is made! You'll notice this year I've been limiting my colour palette to just two or three thread colours. 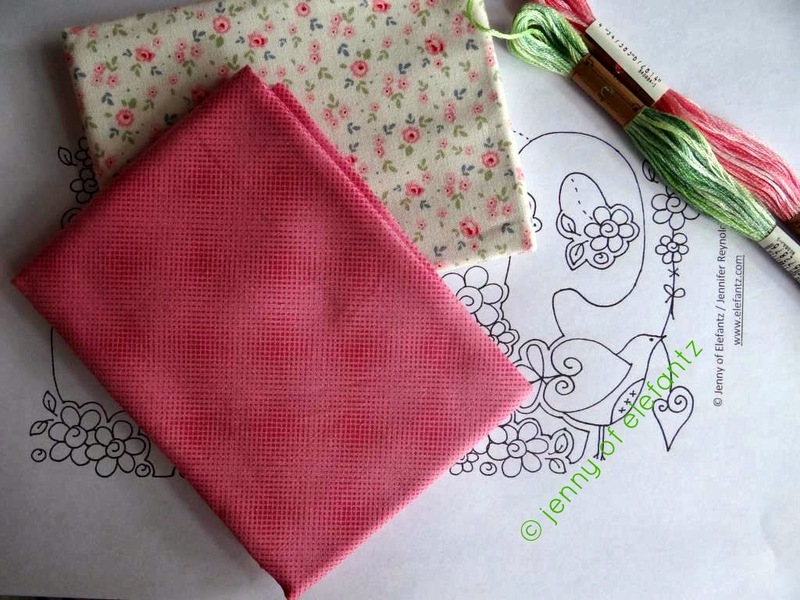 Today I was auditioning fabrics and colours that may inspire you if you stitch these blocks. Which duo do you like best? The full set of 26 'rosedaisy alphabet' stitcheries is available as an instant pdf download HERE in my shop now! I love this set of designs so much that I'm giving you four separate chances to win a set by enlisting help from three of Monday sewing group buddies! * Visit all four of our blogs and leave ONE comment on each, telling Heather, Wendy and Barbra and myself which letter you'd stitch first and why. * Make sure you put your blog address or email in your comment so we can contact you if you win. If we cannot contact you we will draw another winner in your place. Winners will be drawn on March 17th to celebrate St Patrick's Day. GIVEAWAY CLOSED - Winner was Brenda, comment 84, drawn Monday March 17th. 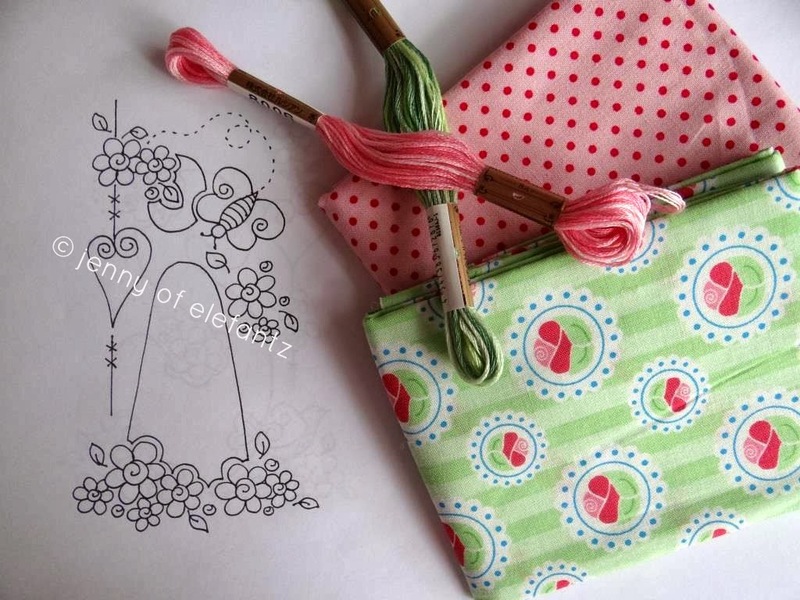 Don't forget, if you can't wait to see if you win a set, you can purchase the full 26 stitchery set of the 'rosedaisy alphabet' HERE in my shop as an instant pdf download - and if you end up winning one of the giveaway prizes I will refund your purchase cost. I will take you step by step through the process of preparing one of the rosedaisy alphabet blocks in a tutorial! Actually, this will help you with any of my appliqued designs, so be sure to drop by. Jenny, You have been VERY busy. Congratulations on all your new designs. My letter of choice is "E". Thank you for all the opportunities. These are just so cute... Love the way you cute around the letters to fit in the flowers, etc. My first letter would be J or H for my granddaughters in Canada. You are so very generous Jenny... as so are your friends. I would love a chance to win and the first letter I would stitch would be a "K" for my friend. Love this giveaway!! Sew much fun and I can't pick just one of your color suggestions!! As I love them all!! Thank you sew much Jenny!! So pretty! I would start with "V" as Violet is my youngest grand daughter's name and I know she would just love to have it framed on her dressing table. Would do it in a mauve. Oh wow! I really love your colors! I would choose either an "S" for my best friend, Stella, or "A" for myself. I rarely make anything for myself, though, so probably the "S"! Baa would stitch B first - well he would get Miss H to stitch it, Miss H would stitch H of course and the Mother would stitch K. She loves the pretty red spot and blue flowers. Miss H likes the green flowers and red spotted flowers and Baa of course likes ALL of them! Such a beautiful giveaway. Thank you Jenny. I would start with "L" for a great grand daughter due in early June. I would do it in soft pink. Love your alphabet. As a kindergarten teacher, the alphabet holds a special place in my heart. Beautiful designs Jenny! 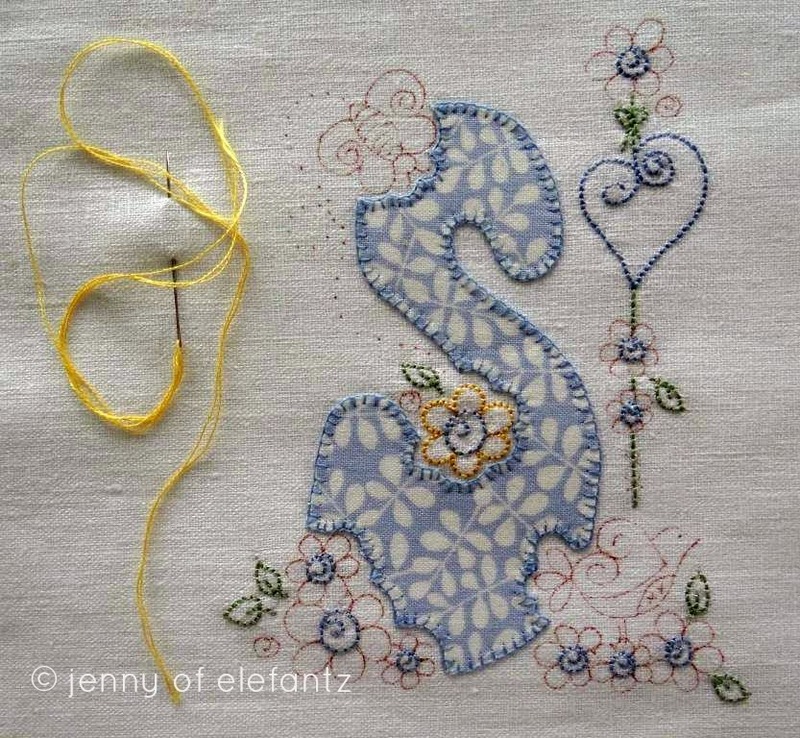 I would stitch the letter my G first in a rose print since I love roses and it is my middle name too. I would choose letter A because of my special Ashlyn. Thanks you giving me a chance to win. I would stitch A for my 4 month old granddaughter, Audrey. I would stitch the K for Kenzie, my first grandchild, a girl, who's due date is March 22nd. I can't wait to hold her! Oh Jenny I just love you alphabet design, I would make the "H" first for my daughter precious Haylee . Very lovely Jenny. You were a busy bee for the weekend. I would try to stitch D first as my own, but as I am really bad at making things to keep for me, I would probably end up stitching an R for a friend. Love your alphabet designs. I would start with K for most oldest grandchild Kendra. I love that you showed the E and S in this post. My daughters are Emily and Sarah. The alphabet looks wonderful. I would stitch P first for my daughter Patricia. These are lovely designs. Thank you. I would start with a P for my mother. Jenny, these are just gorgeous I admired them at LGS, but ran out of spending money. I have two grand daughters, Z for Ziva and P for Paige so they are the two that I would make. I love the first colour way of pink and green ,but they are all so lovely. Hi Jenny! First I want to say thank you. You are such an inspiration to me in who I want to be as a daughter of the King. Your gentle words seem to find me right when I need them the most. I love the softness of the first pic of the rose & green colors but the next one of the blue & red is much more me! I would stitch the letter K first because there are several people who matter most in my life that begin with K: my dearest friend KT, my friend Karen, and my oldest daughter, Korie. Or I could always keep it for myself...lol. So pretty Jenny! I would stitch 2 E's and a J for each of my grandchildren. They love anything grammy makes for them. 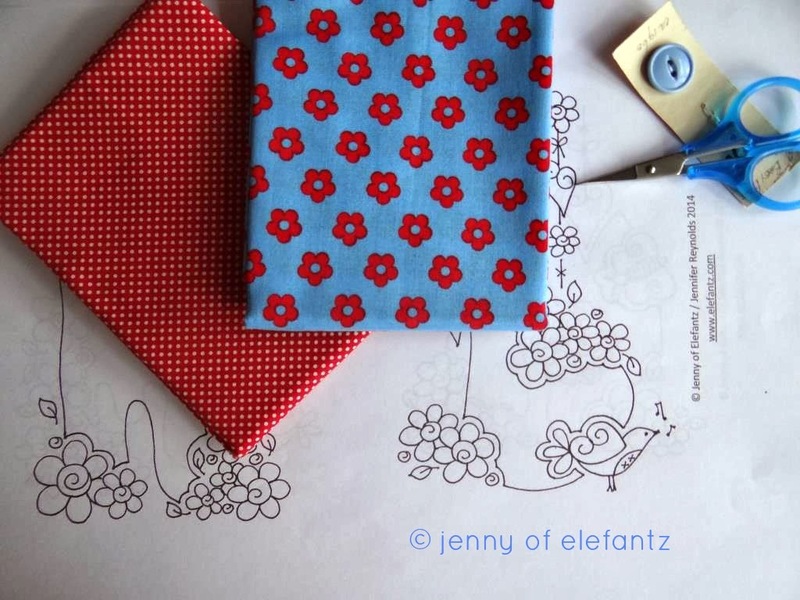 Jenny, I love your patterns! What a lovely giveaway. If I should happen to win I would like the letter "E" so I can make a pretty just for me. Thanks! Ooohhh, these blocks are nice! How awesome would it be to make a alphabet quilt using them - not sure I would have the patience though! Thanks for a chance to win the pattern. I would have to make an A for Annemarie, my eldest, first; in black and white with red flowers I think. Mmm, would a black background work? And then a C for Carina, for that I can use soft blue and yellow like your S, it will go nicely in her room :-). I don't have a blog, but you can get hold of me at marina (dot) apap (at) ncr (dot) com. What a lovely alphabet, I would start with A and stitch all the letters. Hi Jenny, My 1st letter would be H for hope. I walk for relay for life and have done for the last 6 years. Hope is the letters the children carry in front of the survivors as they walk their 1st lap. Followed by the carers like me for 1 lap then everyone walks off and on over 24 hours. We are walking on the 29th and 30th of this month again. Lynette Bramman ljb22@bigpond.com Thankyou. Haven't you been busy! I would start with Z and move up through the alphabet - dare to be different, right? Another beautiful pattern, I would start with M for my son's fiancee and work my way through the rest of them after that ! Just gorgeous - definitely "L" for my granddaughter Lulu. Thanks for the chance to win. Oh Jenny this is fabulous. I love love love the new set. I would probably end up stitching quiet a few of them. What fabulous gifts these would make for my sisters and mom and my nieces and great nieces for birthday and Christmas gifts. I would do the c first for my sister Charlotte. As allways your talent just blows me away. I'd start with 'R' for my eldest son. Sew sew pretty! Once again a much wanted pattern. How do you do it?! This looks delightful. So sweet. So charming. My daughters are J, C and H so I would have to do three at once! It's beautiful Jenny. I would stitch a D of course. 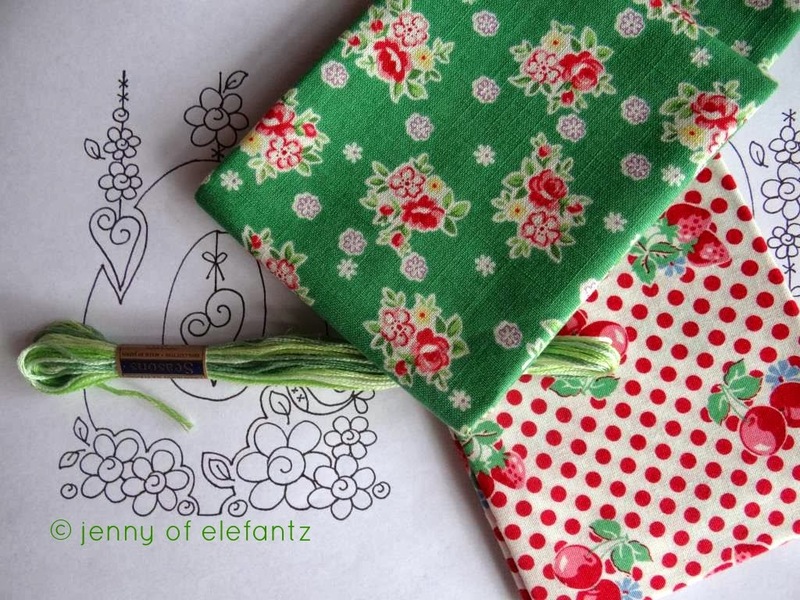 Thank you for the chance to win this lovely pattern. The first letter I would stitch would be H for home, we live in High River , Alberta that was devastated by the floods last June, we lost our basement and contents and my mum and dad's house was destroyed. All good now though for us, the town is still struggling though! I have purchased the pattern already so I hope I am lucky. Keep up the good work. Very pretty, as usual!! I would make an S for my daughter Sam. Thank you for the chance to win. You are one talented lady. The alphabet is just lovely. Jenny, Love the alphabet! I would stitch the B and several times. We have 4 granddaughters: Brooke, Bailey, Blake and Braxtyn. Then I would stitch the C for grandson, Carter. On your colors, I like the first and last set and I love using variegated threads. I would love to win this prize & get started on the " C " for my girlfriends 50 th... The are so cute. These are so lovely. I would start with the b and e for my daughters, then m for myself! Thank you for a sweet giveaway. I would begin with the letters S and J for my daughters. Such beautiful alphabet designs Jenny. I would stitch A for first my GGD1 and then M for my GGD2. I would do A for my niece's first birthday. Aerin is her name. Love your work you are so inspiring! I feel so luck to see my monogram, S, in your blog post. I'd likely start there and make a little something (journal cover, maybe?) for me. I did share you on face book. The new Alphabet is so lovely. But then all you items are lovely. My daughter is Ellen so an E first. I would start with L because I want to put something pretty on my sewing room wall. Thanks for the chance. 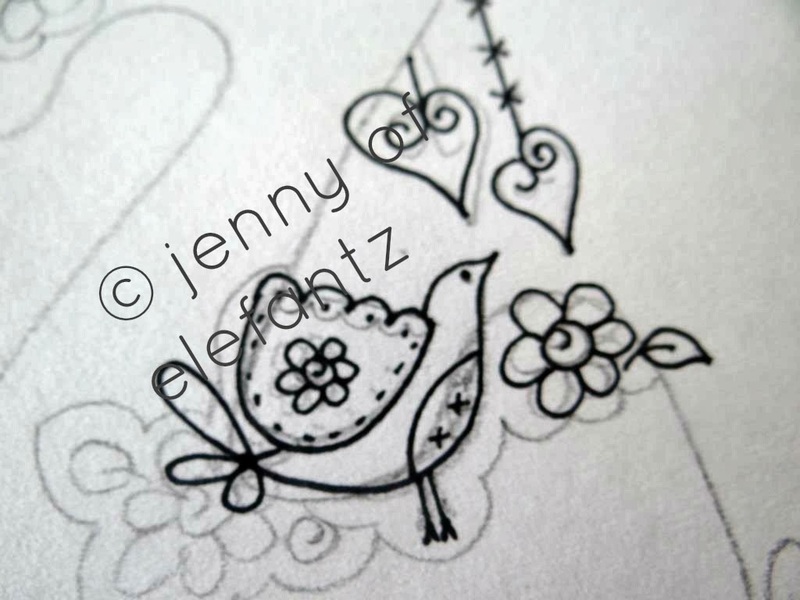 Sweet patterns, Jenny. Thanks for a chance. I would stitch a "Q" for quilt on a wallhanging for my sewing studio. I love your Rosedaisy alpha! It is so adorable. As I was thinking of which letter I would begin sewing, I was laughing right out loud at myself. Me?? Do just one, nope, I know I will be sewing the entire set, beginning with M. Blessings to you Jenny, to continue creating and having fun doing so. Because it certainly is a joy sewing what you have shared with us! Jenny, they are all beautiful! I would stitch M for my MIL. Her birthday is at the end of the month. Thank you ladies for this awesome giveaway! 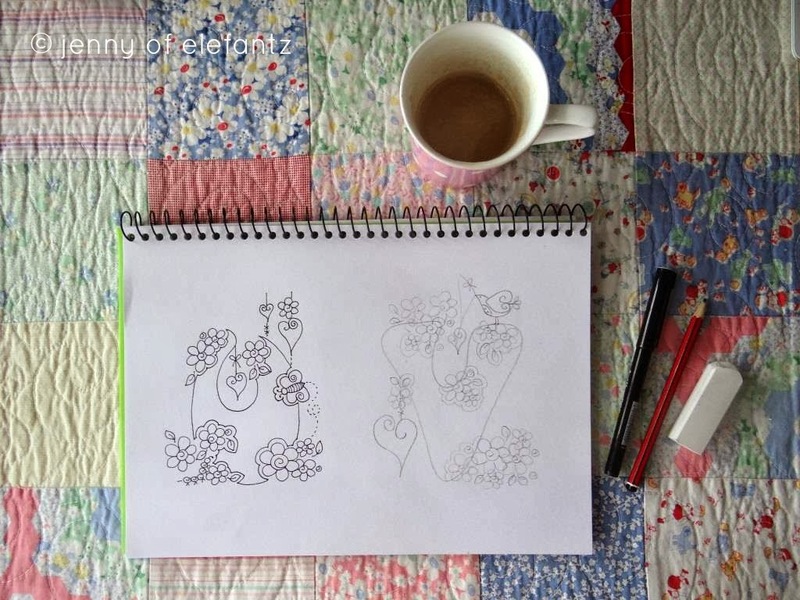 Your Rosedaisy alphabet is just gorgeous, Jenny. I'd love to make one for one of my swap partners so the initial I would use first will have to be a secret! Thanks for the lovely giveaway, Jenny. Very beautiful, Jenny. Would make the first one the initial "L" for my Mom's birthday. Que lindo sorteo, me encantaría tener estos patrones!! So pretty! I think I would do the letter S first, the first letter of my last name! I would choice to do C first. Many GS but only one Grand daughter Chloe! Thank you for sharing your beautiful work. Love the alphabet, would have to be M for my grandaughter. Ah, eu gostaria do "L", porque é o nome de minha neta , que deve nascer fim deste mês. Love your work Jenny. Would love to win this. Your alphabet is gorgeous and I love your rose stitchery. I would choose the letter "E" for my daughter in law to be. It would make a great bridal shower gift for her. Thank you for the opportunity to win a set of your special alphabet. The letter I would use first is M for mum. She needs a pick me up and I would put it on a night dress I will be making. Thanks for the chance to enter. I love the little floral with the cream background and the rose colored pindot companion. This is a delightful alphabet and I would stitch the letter W. Blessings to you! I would stitch the letter T first because I would make it as a gift for my secret pal.Thanks for the chance to win. I love love love these designs! I am envious of your special talent. I would do an A first for my granddaughters Abigail and Ansleigh ( I would have to do 2)! 'Love all your designs---you are so talented---a God given gift!! I would love to do them for my granddaughters and my first great daughter. Jenny, my choice of letter I would do first is "L", because I LOVE, LOVE, LOVE all your beautiful designs! 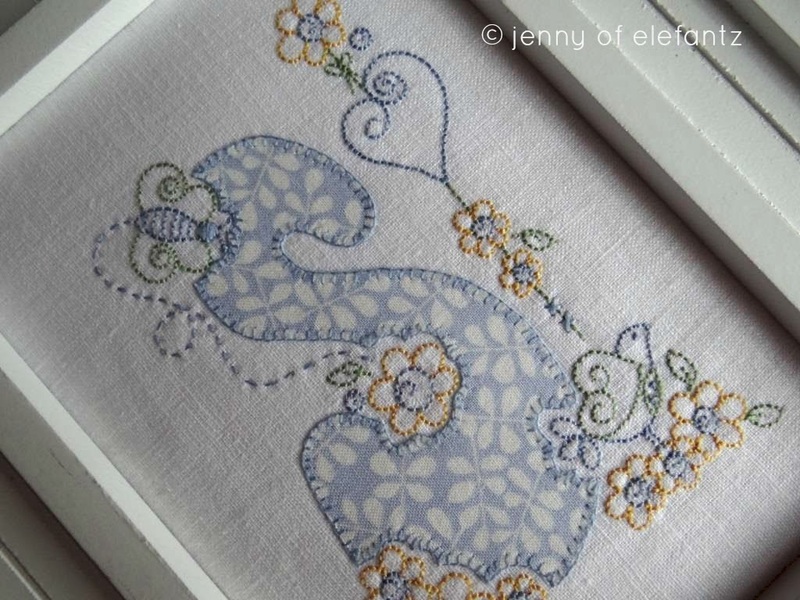 I think you've outdone yourself with this pattern, Jenny! Every letter is lovely. I would start with an M, the initial of our family name. Have a great weekend! Beautiful! I would start with the L -- for a special little girl who is the only girl in my friends set of quadruplets! As usual, I love your design. They make me happy. I would make the A because Monday, St. Patrick's Day is our anniversary. 19 years with lots of ups and downs. Thank you for everything you do. Sharon K. Lozano slozano5@earthlink.net Jenny, thanks for mentioning an unhappy house. We left one too, and it's been a great relief. Hi!!!! These are so cute!!!! I would choose A first for newest grand daughter I haven't made anything for yet!!!! Then E and J for other two grands!!!!! Then either a R for my moms first name or M for Mom!!!!! Oh!!!! I could go on and on!!!!! Thanks for the fun!!!! These are such lovely designs. If I was to win the patterns I believe I would start with "A" just to keep order to the alphabet. Thanks for the chance to win. The letter E for Emma and Ethan, grands. They'll be great for Christmas ornaments for next December. I do one for each each year. I love the red and green fabric. Beautiful Jenny! I would start with A for my name and use it on a pouch for my Ipad. Thank you for the chance to win. Seems like this would be pretty for Easter, so was thinking "J" for Jesus. Jenny you've nailed it again with another useful and beautiful design. I would start the alphabet with "A" for Annette. It's beautiful! I would start with C for me and E for my daughter Emmeline! What a lovely alphabet design Jenny. I would choose S first for Sarah, my granddaughter. Jenny, you did it again!! Beautiful!!! What a gift to be able to design like that and the gift to do it so quickly. I am full of WOW!!! The first letter I would do is the letter "O" for my front door. I think it would be lovely, fun and so darn cute!!! They are beautiful Jenny! I would probably do the R for my name. APRECIADA HE JENNY UN PLACER SALUDARLA Y FELICITARLA POR SU HERMOSA LABOR, ESTE NUESTOR PROYECTO SUYO ME LLENA DE EMOCION, YA QUE ME ENCANTAN LAS LETRAS PARA BORDAR, BUENO ENTIENDO QUE HAY QUE ELEGIR ALGUNA LETRA LAS MIAS SERIAN A - V INICIALES DE LOS NOMBRES DE MIS NIETAS. Very pretty designs. I like that yours have a limited color palette. It gives them that soft 30's feel. No sweet little Granddaughters here (yet) so I would make an R for my craft room. This alphabet is so cute. I love how you combine applique and embroidery. I think the first I would stitch is L for my daughter's initial. Thank you for the coming tutorial too! 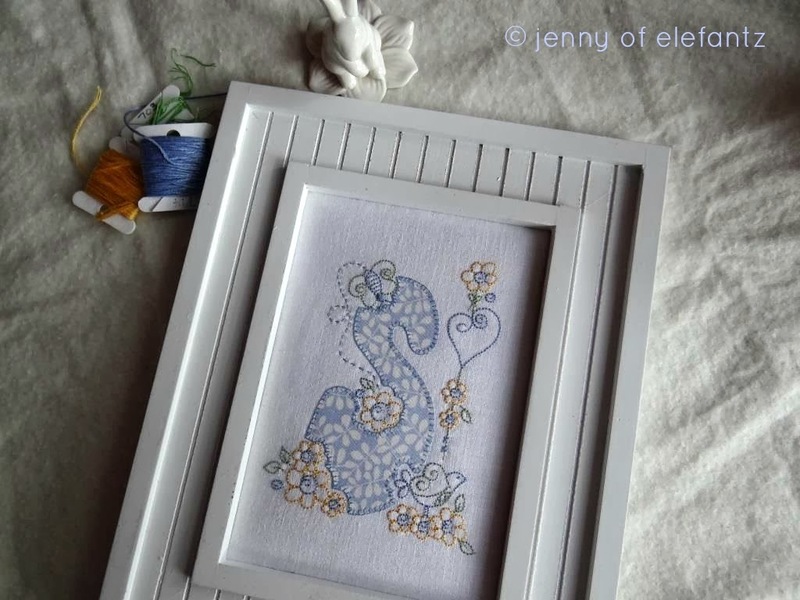 Thank you, Jenny, for the chance to win your beautiful alphabet. I love applique and embroidery. I would stitch "K" first for my friend Karen. She is a sweet and giving person so I like doing things for her. My letter to create in the Rose Daisy letters would be "A" for my Adorable Aidan! She is ten now and a notebook cover would be ideal I'm thinking! My letter would be A for my granddaughter Amelia who turned 3 on Wednesday. I am making a Quiet Book for her and couldn't decide on the front cover and your design would be perfect. Beautiful designs, Jenny. Keep up the inspirational work you do! I would star with L, for my daughter Leslie and my granddaughter Laylah! I would do a E for my last granddaughter Evie which i keep! I will go and order these as soon as I can! You are doing great Jenny! What a wonderful idea for gifts! My first choice with be a J for my amazing daughter. I'd use a blue and yellow palate like the S even though it's not among those choices. Thanks for sharing! I'm sure all 26 are fabulous. I would choose the "S" for my daughter, Sarah. 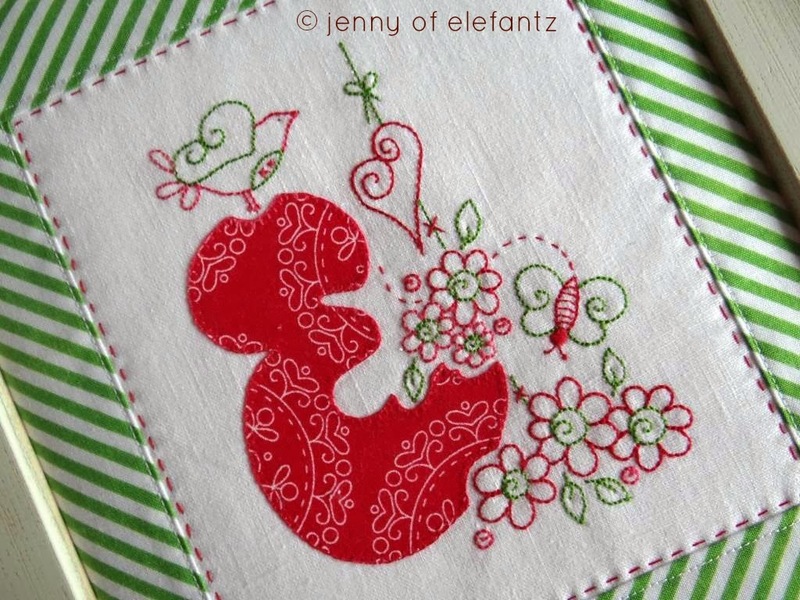 I love both applique and stitchery, and I'm crazy for your designs. Thank you so much! These are just lovely. I'd start with an "S" for me then make a stitched tote using a "C" for a special cousin of mine. Dear Jenny, these are wonderful again! I love your designs, they make me happy and bring piece in my heart. I would choose E for my daughter Eszter as first. Hugs from Hungary! I like the blue and red combination! I'd probably stitch W first, something for me for a change! I'd also do an S for my mum and N for my MIL. I would stitch the E first for our family last name. thank you for a chance to win your alphabet. It would have to be an L for me first of all, then I would work through the alphabet for all my friends! Lovely Jenny - thank you. Love your designs. They are so happy! My first letter would be A. A perfect gift for my new great nice born in December. It is so nice that you have designed them to fit a frame. Love the designs. They are so fresh. I would start with a B as that is the first initial of my name. Thanks so much for sharing. I would start with G and S, my son and my daughter's initials. Love your work. Bea. Olá, gostaria muito mesmo de ganhar, pois seu trabalho é maravilhoso. A letra que bordaria seria o R, porque as três pessoas mais importantes da minha vida são meu marido Ricardo e meus filhos Rodrigo e Rafaella. Obrigada pela oportunidade Deus te abençoe. Bonjour Jenny ,merci de nous permettre de gagner je choisie la lettre E,belle journée que dieu vous bénisse. Hi Jenny, first of all, I want to thank you for the inspiration and I admire you for wearing your Christianity on your "sleeve" there are not many more out there that will be brave enough to do so! I, too am a Christian, born-again. Second of all, I love your whimsical designs that your produce, I love to do hand work and add it to my quilts. I am so thankful that you did an alphabet, this is just precious. The first letter that I would probably do is S for my daughter Samantha, then F faith and so on. Thanks again for the chance to win this! YOur designs are always so sweet. I would make the letter C which begins my name! You have been busy and as always your designs are gorgeous. I would start with the letter A as it is not only the first letter of the alphabet but the first letter of my daughter's name. Your design is beautiful. I envy the ability you have to draw a design that is in your head.I would do the letter "J" first for my petal of a granddaughter Jorja. Thank you for the opportunity Shirley N.Z. I love your designs. I would do L for Lily, C for Chloe and R for Riana, my three lovely Granddaughters. Thank you for your generous giveaway. I didn't know you had granddaughters! I would stitch one for each of my granddaughters. So I would start with T for the oldest, Trista. My contact details are in my blog profile. Thanks so much for your talent. You make beautiful patterns. I would stitch B for Beverlie and A for Annabelle, my two granddaughters. Your designs are so beautiful. I would stitch the H for my last name. Jenny these are beautiful! Since I left each of my three initials at the other sites I am going to leave the best letter here. L for Ladybug my dog and my blog Ladybug Dreams. I would love to win! I would have to do two for my daughters, so it would be R or D. I would need to pick from a hat. Thanks for the chance. Jenny you have such a God given gift of creativity! Thank you the chance to win this beautiful alphabet! This alphabet is just lovely. I think I would do four letters! L,O,V, and E to make into a pillow. Thank you for sharing your talent with us. I enjoy every e-mail you send out. You have so much creative talent. I'm sure glad you share with us. The letters I would use would be the A for my granddaughter Alexa and then J for her sister and L for Lexx my grandson. What a sweet, sweet alphabet! Love your designs and would make the "E" for my granddaughter who lives way to far away! She would love it! These would make wonderful gifts for friends and family. Anything hand stitched is a treasure!! Thank you! Love these! So girly and fun! I'd start with the letter "S" for my baby granddaughter Scarlett!